On 7th Dec, 2013 Fourth National Key Calender PV Glass Symposium was held in Beijing, which is organized by China Architectural and Industrial Glass Association. On 7th Dec, 2013 Fourth National Key Calender PV Glass Terrain Symposium was held in Beijing, which was organized by China Architectural and Industrial Glass Association. Delegates from 22 companies across the country took part in the meeting. 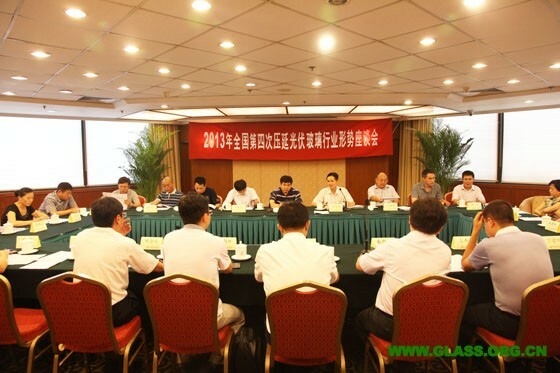 Vice president and secretary general from China Architectural and Industrial Glass Association, Zhang Hengji attended the meeting and delivered an speech. He summed up the achievements on the previous stage due to the industry in accordance with regulations. He also pointed out the existing problems: along with the gradual unveiling of the policy that nation supported PV industry, for the present the industry overall situation was quite well, such as the balance between the supply and marketing, the economic stable operation. However, it also existed a series of problems like excess production capacity, accounts and financial risk, and EU anti-dumping countervailing. He also put up with the measures that companies needed hold togrther to guard against market risks, control capacity, and respond actively to anti-dumping countervailing. In the meeting, the delegates communicated with the situation, like recent economic operation, the production, management, inventory of the key enterprises. In addition, the industry status and future devolopment trend was discussed, and the key problems and the contradiction during the operation of current industry and economic development was studied. Especially in terms of normalizing market order, dealing with finicial risks and inflation of gas prices, blacklisting, cash on delivery and further collection of overdue accounts receivable etc, the meeting had an agreement.